Sweden gets an imagery upgrade, but is it censored? 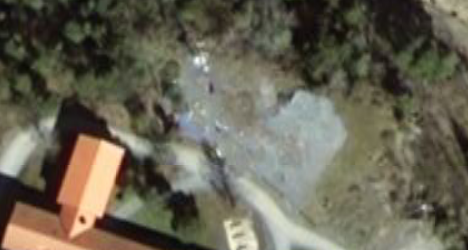 This past weekend’s Google Earth imagery update has brought higher resolution imagery to the lower two fifths of Sweden — I’m guessing around 1 meter resolution from looking at the resolution of cars. The imagery is credited to Lantmäteriet, Sweden’s state GIS agency, which previously has been excoriated on this blog for its blatant attempts to camouflage its censorship of “sensitive sites” in its imagery. Until now, Google Earth hasn’t used Lantmäteriet’s data, opting instead for uncensored Digital Globe tiles on top of 15m resolution base imagery. But is it? 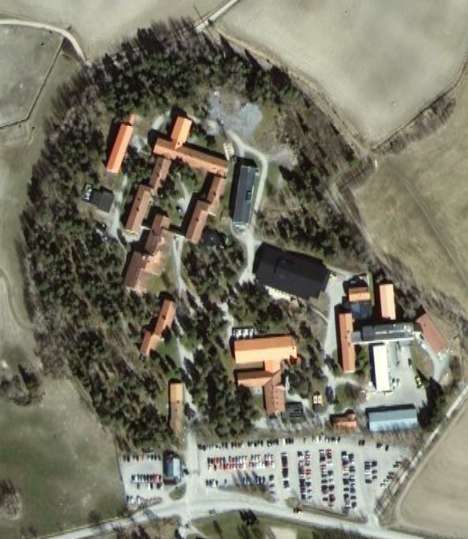 Looking back through Google Earth’s historical archive of imagery, which contains Digital Globe imagery guaranteed to be untouched by Lantmäteriet’s censorious instincts, it is easy to toggle the current view with older imagery. 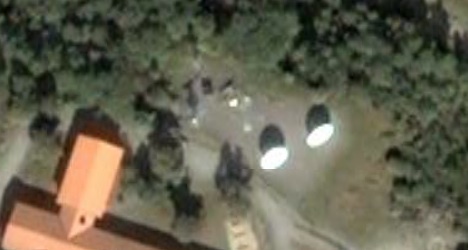 Notice how there are two satellite dishes at the north end of the compound, pointing in different directions across the years as they are photographed by passing satellites. Imagery from August 7, 2007, credited to DigitalGlobe. But they suddenly go missing in Lantmäteriet’s most recent imagery. Current imagery, credited to Lantmäteriet. One possibility is that they were dismantled. But look closely, and the area shows inconclusive signs of photoshopping — there is some faint ghosting and repetition, and the tonal gradations don’t look as smooth as elsewhere. You wouldn’t notice it, unless you were looking for it. Would Lantmäteriet still do such a thing? Absolutely. Here’s an excerpt from an interview with Lantmäteriet’s head of security, Michael Munter, back in April 2006, when he explained why it was possible to buy imagery from them that appeared unretouched — the answer being because it was retouched, just more cleverly than before. In our image there are retouched areas, but not buildings. The secret objects are retouched, but in another way. It isn’t often that we retouch buildings. My suspicion is that those satellite dishes are the kind of “secret objects” he is referring to, and that we’ve just found a case of such censorship. It should be easy enough to test the theory: Lantmäteriet’s source imagery comes from SPOT, IKONOS and QuickBird satellites, which is available via channels other than Lantmäteriet, so it’s only a matter of time until a reference image is available for comparison. I understand (but don’t approve of) the fact that some national GIS agencies feel the need to censor imagery before releasing it to the public, even if it’s a useless pursuit in a world of multiple international sources for such imagery. What I really object to, however, is the attempts to obfuscate such censorship by adding geographic fictions to imagery. It makes such images less than useless, because not only are they fictional in some places, you don’t know where they are fictional, which brings the entire dataset into disrepute. Anything you look at might be fake. Instead, Lantmäteriet should do like their Dutch counterpart. If they feel compelled to censor, they should pixellate in an obvious way, so you know where the imagery has been degraded and should not be relied upon. Of course, Lantmäteriet may have mended their ways, and those satellite dishes really have been dismantled, but lingering suspicion is what you get when you’ve been caught lying about your data once before.